Marriage is a challenge. Growing your business is a challenge. What happens when you try to combine the two? I know first-hand how daunting it is to blend these two endeavors. You see, I'm in business with my wife. For over twenty years my wife and I, both psychologists, have directed The Couples Institute. As psychologists specializing in marriage counseling, we should have all the skills necessary to blend business and marriage, right? In fact, the opportunities for us to disagree are practically limitless. Fortunately, the opportunities for us to grow together are even greater. For our own personal and marital survival we have had to develop some really effective methods to make decisions, solve problems, and negotiate better solutions. There has been a lot of trial and error–more error than I would like to admit. But in retrospect, we seemed to have learned from these mistakes. And over the years I've had ample opportunity to try these techniques in my practice and refine them to fit a wide variety of couples and their situations. The result is that we have developed a refined negotiation strategy that works. Really works. Negotiation can be messy and riddled with tension. Finger pointing, selfish demands, and resentful compliance are often part of the process. But this is normal. Managing tricky emotions is part of negotiation. So are conflicts of values and feelings. These factors do not lend themselves to an easy list of negotiation steps. In this article you will learn why I tell couples to stop trying to define the problem. This is a deadly mistake that couples and even negotiators make. In fact, defining the problem just makes things worse. I know this sounds like heresy, but I needed a faster way to help couples resolve their problems. There is more. If you don't have a better way to manage unruly emotions when negotiating, then all the great steps and guidelines in the world are useless. 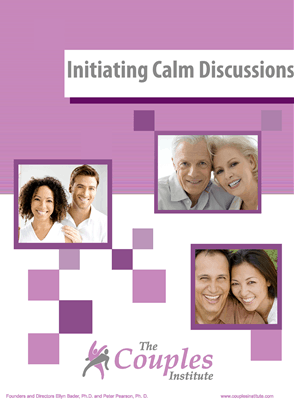 So you will learn how to manage your emotions during negations with your spouse. Here's a warning. This is not a short article. I want to give you the best chance possible to negotiate workable agreements with your partner, so you will get more depth than the typical “Redbook” or “Good Housekeeping” story. As an extra benefit, this process will help you in your business and with your children as well. Conflict is inevitable for growth in your relationship. Many people are frightened of conflict because they can't negotiate. If you can negotiate you don't need to be so afraid of conflict. Good negotiation leads to acceptable solutions that work for both and strengthen your relationship. Your communication skills automatically improve as you develop good negotiating skills. These are the best and are often difficult to attain. They require self-knowledge plus a very high degree of understanding of your partner's values, concerns and desires. Respect for yourself and for your partner, openness and persistence becomes the grease that makes negotiation successful. Negotiation is an ongoing process, not a one-time event. The more complex the situation, the higher the stakes, the more your core values are involved, the longer it will take. The more complex the problem, the more trial and error solutions will be attempted. There is no such thing as a perfect solution. Every solution sets the stage for another problem. This will likely be a challenge you would not have even attempted because you were stuck on a lower rung of the ladder. The amount of self disclosure required is higher for couples. Effective compromises for complex problems require lots of openness, curiosity, and emotional risk. Ask yourself how you aspire to be during the negotiation. For example, calm, open, flexible, honest, understanding, curious. By following guidelines set for yourself, you can stay more easily focused toward a successful outcome. This is an often overlooked aspect of negotiation. Staying conscious of your own guidelines will help keep you centered and focused. Write your guidelines on a piece of paper and keep glancing at them during the negotiation. You will come across like an experienced negotiator simply by staying consistent with your own guidelines. I don't deserve it. I'm not worthy. If I get what I want I will be obligated in the future to give when I don't want to be giving. My partner doesn't care about what I want. What I want is more important than what my partner wants. Have to fight for what you want in life. Whoever wants it the most should get what they want. To get what I want, what will I need to do and what will my partner need to do? If I get most of what I want what is the positive and negative effect on my partner? How could I make it easier for my partner to say yes? I'm afraid if we don't resolve this disagreement, then the effect on me and my partner might be _______________________________. If I get most of what I want, the effect on me would be _______________________________. If I get most of what I want, the benefit to my partner might be ____________________________. However, it may be difficult for my partner to give me most of what I want because __________________________. I may be able to increase the benefits to my partner by ___________________________. I may be able to decrease the downside to my partner by ___________________________. Add other relevant information that has not been suggested here. Do not feel like you need to robotically go through these questions and statements in a dialogue with your partner. But as you get mentally clear about these issues it will make it easier to conversationally express your concerns and desires. It is important to describe the issue as disagreement instead of as a problem. It is very difficult to say “The problem is ___________” without pointing fingers at your partner or yourself. This actual or implied finger pointing leads to a defensive reaction from one or both parties. The negotiation then begins to slip like a house built on loose gravel. Then take turns expressing what your concerns and desires are about the disagreement. One person goes first and expresses all their concerns while the partner listens without rebutting or defending anything. The response is simply to recap and check for understanding. It may also be necessary to ask questions for clarity. After each person has expressed all their concerns and desires, and each of you feels understood, then it is time for brainstorming solutions. Honey, what I suggest is ____________________________________. This suggestion works for me because ____________________________________. This suggestion might work for you because ____________________________________. It encourages being a good self advocate. Simultaneously it forces you to consider your partner's perspective and helps prevent the possibility of being a stubborn for only what one person wants. If the partner agrees with the whole suggestion, then recap why it works. If the partner does not agree then start with recapping the part that does work. The part that does work is _________________________________. The part that doesn't work is _________________________________. So my alternative suggestion is _________________________________. This suggestion works for me because _________________________________. And it might work for you because _________________________________. Add value to your offers. Keep finding ways to make it easier for your partner to say yes. Remember – this negotiation is only an experiment- nobody is locked into a permanent solution. It is only for a period of time to see what if anything needs adjusting. Repeat suggestions until agreement is reached. If action is appropriate, decide who will do what by when. Decide for how long you will try this solution. After the action phase come back and evaluate the results. If things are fine, continue for another block of time. If it didn't work out as well as hoped, each person begins by saying, “Honey, it didn't work the way I hoped, but here is what I could have done differently.” Don't start by stating what your partner should have done differently. Then repeat appropriate steps above. Thank you so much for sharing this important steps of negotiation.